Abu Dhabi, UAE, 26 March, 2018: Czech driver Martin Prokop and Chilean rider Pablo Quintanilla were the big winners today as the Abu Dhabi Desert Challenge powered by Nissan served up a potent reminder of how difficult it is to find a path to victory in this event. Partnered by David Pabiska in a Ford F-150 Evo, Prokop won the spectacular 287km Nissan Stage 2 to grab an advantage of 10 mins 30.2secs from Poland’s Jakub Przygonski and Belgian co-driver Tom Colsoul as the overnight cars leaders fell to second place in their Mini John Cooper. Finishing the day in third place, 1 min 24 secs further away in their Peugeot Abu Dhabi Racing Team 3008 DKR, the UAE’s Khalid Al Qassimi and French co-driver Xavier Panseri still retained hopes of a second successive Desert Challenge win with three demanding desert stages remaining. With Saudi Arabia’s Yasir Seaidan and Russian co-driver Aleksei Kuzmich slipping one place to fourth in a Toyota Hilux Overdrive, Frenchman Cyril Despres and Swiss Steve Ravussin in a Buggy Ford 2WD and Russians Vladimir Vasilyev and Konstantin Zhiltsov in a Mini Cooper Countryman completed the top six. 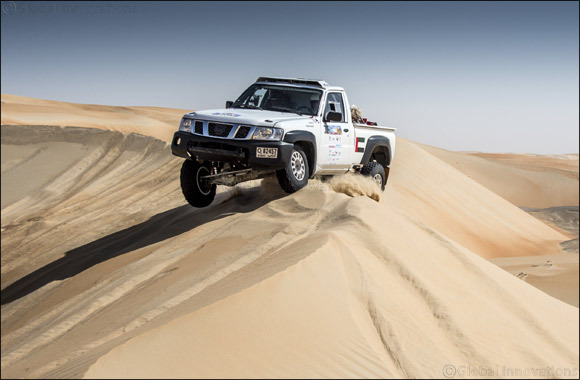 Emiratis Yahya Al Helei and Khalid Alkendi finished the leg holding seventh place in a Nissan Pick Up and South Africans Terence Marsh and Riaan Greyling in a Nissan Navara made it an even better day for the manufacturer by entering the top ten. But it was a day to forget for Frenchman Luc Alphand and German co-driver Andreas Schultz, who were second at the end of the first leg in their John Cooper Works Buggy but plummeted from contention after losing a lot of time among the dunes. On a day when the heat and soft sand of the desert dunes made it a particularly tough stage for the riders, Quintanilla set the fastest time on his Husqvarna to take a lead of 1 mins 8 secs from the KTM of Dubai-based defending champion Sam Sunderland. But with Argentinian Kevin Benavides on a Honda and Austria’s reigning Dakar Rally champion Matthias Walkner on a KTM both in hot pursuit, just 2 mins 39 secs separated the leading four riders. Portugal’s Paulo Goncalves, the 2014 Desert Challenge champion, and American Ricky Brabec on a Honda completed the top six, but Australia’s overnight leader and 2016 winner Toby Price plunged out of the reckoning because of a shattered fuel pump. Top Emirati rider Mohammed Al Balooshi, recent winner of the Dubai International Baja, held on to his top ten place among world-class competition with another good performance. Taking place under the patronage of H.H. Sheikh Hamdan bin Zayed Al Nahyan, the Ruler's Representative in Al Dafrah Region, the Abu Dhabi Desert Challenge is forms the third round of the 2018 FIA World Cup for Cross Country Rallies for cars and buggies and the opening round of this year’s FIM Cross Country Rallies World Championship for bikes and quads. The Abu Dhabi Desert Challenge Powered by Nissan is supported by Al Dafrah Region Municipality, Abu Dhabi Municipality, the UAE Army, Abu Dhabi Police, Nissan Middle East, ADNOC, Abu Dhabi Aviation, Al-Ain Water, National Ambulance Service, Tadweer, Yas Marina Circuit and the Qasr Al-Sarab Desert Resort by Anantara. Finish: Yas Marina Circuit – 4.30pm.